Eli nodded. 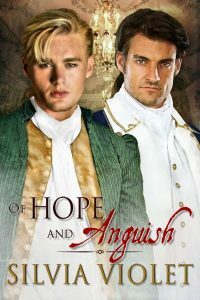 The previous spring, Constance had fallen in love with Major Randall Bradford, a British officer, but she’d been reluctant to talk about the nature of their arrangement, and Bradford had left the city with Howe’s army on the campaign to take Philadelphia. He could no longer say the same for himself. “I will do whatever must be done to end this war except betray Jack’s confidence.” It had been three months since he’d seen the man he loved. And even their correspondence had been sparse. He dreamed of Jack often, but waking alone, grasping after dream images, only made him miss Jack more. Her words brought to Eli’s mind the monster who’d jailed and tortured him, intending him to betray Constance, Jack, and their army contacts. He’d refused, and it had almost cost him his life. He still bore scars from the experience, and several fingers on his left hand would always be crooked, but he would suffer all of it again to keep those he cared for safe. “Is there still hope it will end in our favor?” Terrible news of the state of Washington’s army had added to Eli’s malaise. Men were deserting in large numbers. Those who remained were cold and hungry, and disease was rampant in the camp.